With the introduction of the elegant Model N limousine in 1905, Packard became one of the first American automakers to offer its patrons both contemporary styling and the advantages of protection from the elements. Hats, goggles and dusters became optional motoring attire. Peerless followed suit that same year, as did the other of the famed Three P’s, Pierce-Arrow. Cadillac enclosed its first car in 1906, adding the Model H coupe to its luxury offerings. By 1910, sedan, brougham, town car and limousine body styles had been introduced by nearly every American automaker to complement traditional touring, phaeton and speedster models. Looking back on the public’s perception of the motorcar from the 1910s to the 1920s, and its emergence during that period into the mainstream of American life, it may well be that President-elect Warren G. Harding was personally responsible for a significant turning point when he chose to ride down Pennsylvania Avenue to the White House in the rear seat of a Packard Twin Six, rather than a traditional horse drawn carriage. The 1921 inaugural would mark the first time that an automobile was prominently featured in the traditional parade. Not only did this do wonders for Packard, but it also heightened the public’s awareness of an already thriving American automotive industry, and revved consumer interest as the Roaring Twenties charged down the road to riches and ruin. The four-passenger Victoria body was accented with this unique louver design along the doors and below the rear quarter windows. 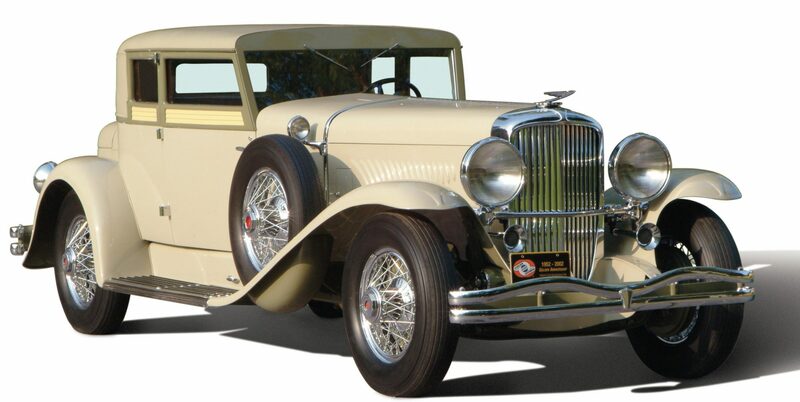 By 1928, when the Model J Duesenberg was introduced, enclosed coachwork had become the predominant body style in America, although looking at surviving examples of the J, SJ and JN models, one would be hard pressed to find support for that statement. Many of the most handsome formal bodies produced for the Duesenberg chassis have been junked over the years and replaced with more fashionable reproductions of the sportier dual cowl and torpedo phaetons, convertible coupes and speedsters built by LeBaron, Brunn, Rollston and Murphy, the latter being the most prolific manufacturer of open coachwork for the Duesenberg chassis. The Walter M. Murphy Company of Pasadena, California, was established in 1921 and quickly became one of the most influential and avant-garde design houses in the country. As the principal coachbuilder for Duesenberg, Inc., Murphy produced nearly 150 bodies for the J chassis by 1932, when the Depression claimed the Pasadena Company among its financial casualties. Another of Duesenberg, Inc.’s principal coachbuilders was the J.B. Judkins Company in Merrimac, Massachusetts. This was an old, established American carriage maker, founded in 1857 as Judkins & Goodwin in West Amesbury, later called Merrimac. By the 1860s, Judkins & Goodwin had become John B. Judkins & Son, and was specializing in the production of enclosed carriages. One of earliest manufacturers to venture into the automotive field, the New England coachworks built its first motorcar bodies in 1897 after being contracted to produce 20 brougham-like cabs for the Electric Vehicle Co. of Hartford, Connecticut. Divided between carriage production and automobile bodies after the turn of the century, by 1905 the Judkins name could be found on such exclusive motorcars as Peerless, White, Winton and Locomobile. Five years later, carriage production was over and done with and the company concentrated solely on automobile bodies, most of which were designed and tailored for individual clients. 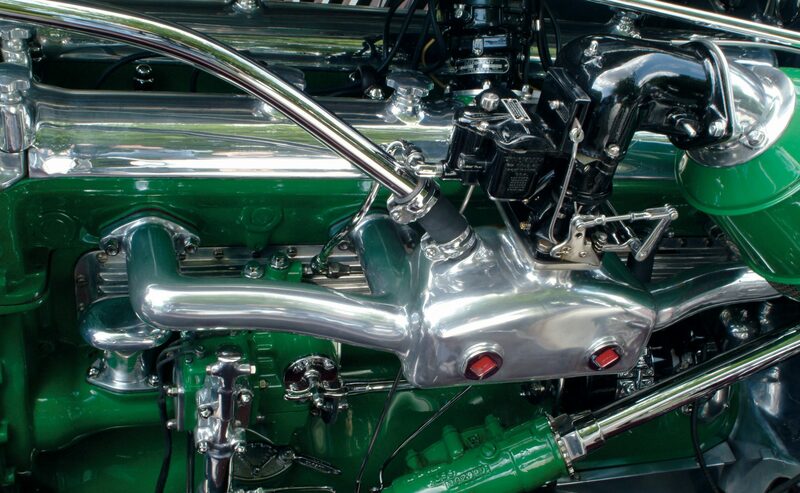 There are many claims as to who built the most beautiful engine…Mercedes-Benz, Bugatti, Rolls-Royce, or Cadillac with its gleaming black V16, but when all is said and done, the apple green and bright steel finish of a Duesenberg straight eight is unbeatable! By the 1930s, J.B. Judkins Co. was among America’s foremost coachbuilders, commanding top dollar for their designs and high-quality workmanship. The firm continued to build bespoke coachwork, as well as offering custom bodies in series of 100 or more for manufacturers. Judkins’ chief designer, John Dobben, worked closely with many of Detroit’s leading stylists, and along with Edsel Ford designed most of its Lincoln-based models. Also following the closure of LeBaron’s New York office in October 1930, talented illustrator R.L. Stickney joined the Judkins design staff, adding yet another touch of creative genius. In addition to Lincoln, Cadillac and Duesenberg, Judkins produced coachwork for Packard, Marmon and Pierce-Arrow, among others. During a 20-year period, from 1921 to 1941, Judkins manufactured thousands of bodies, some 5,900 for Lincoln alone. For Duesenberg, Judkins bodied a total of 25 Model J chassis between 1929 and 1936. 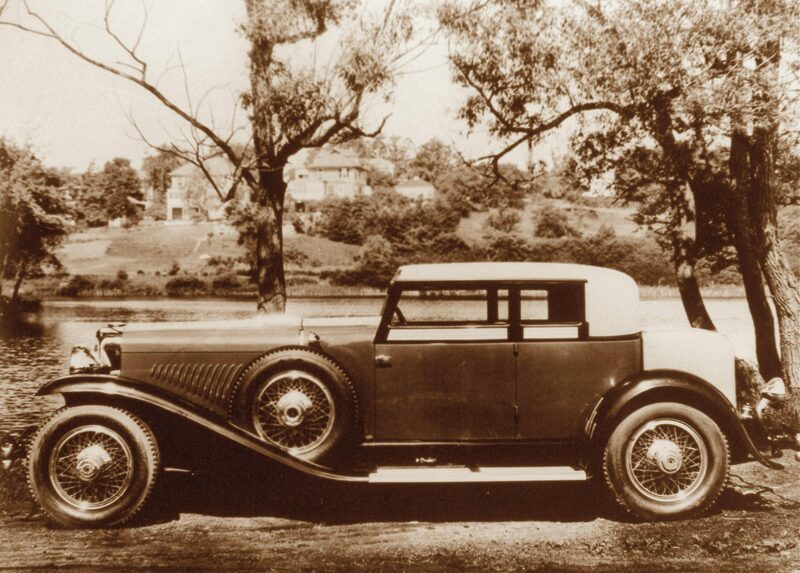 All of the Duesenbergs clothed by the New England atelier were limousines, berlines and coupes. 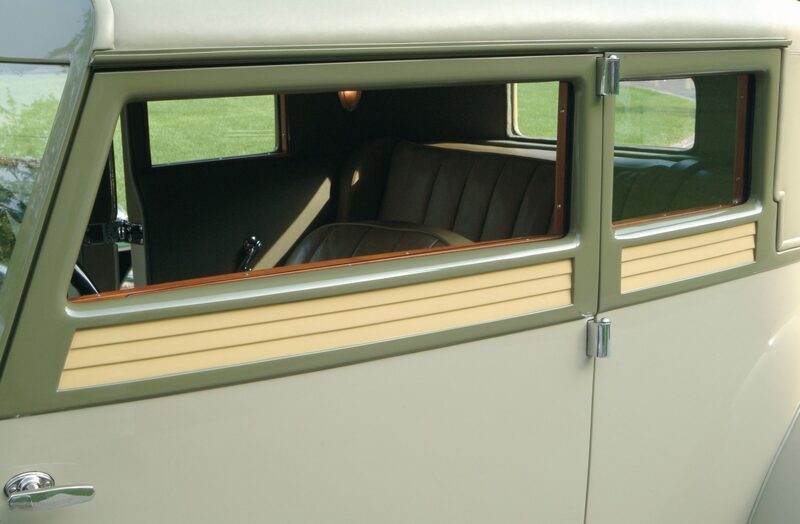 Among the most attractive of all Judkins closed-body styles was this unique four-passenger Victoria coupe, J-354, built in 1932. Another, J-333, shared a similar design. A short wheelbase luxury car, the Victoria coupe could be owner driven, but also lent itself to secluding two passengers in a plush rear compartment equipped with a relatively new invention, the automobile radio. In the early 1930s this was rarely seen. 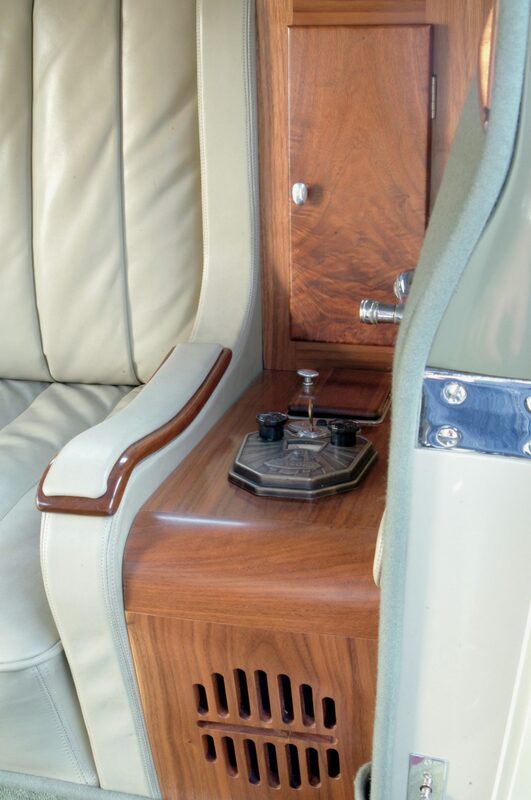 The Judkins was equipped with a Crosley radio and speaker mounted in a wood cabinet next to the left rear armrest. Powell Crosley, who went on to build his own cars in the late 1930s and early postwar 1950s, manufactured some of the earliest car radios and made a fortune. In addition to J-354 and J-333, Duesenberg stylist Gordon Buehrig also designed a pair of sporty two-passenger coupes produced at Judkins, but the balance of coachwork coming from the Merrimac Company were stately limousines and traditional four-window berline body styles. Judkins did have one brief venture into waters more commonly navigated by Bohman and Schwartz, when company stylists designed a single six-window sedan, J-524, with a custom, sweptback grille and flowing, rakish fender lines. It may well have been the most beautiful car Judkins ever designed. 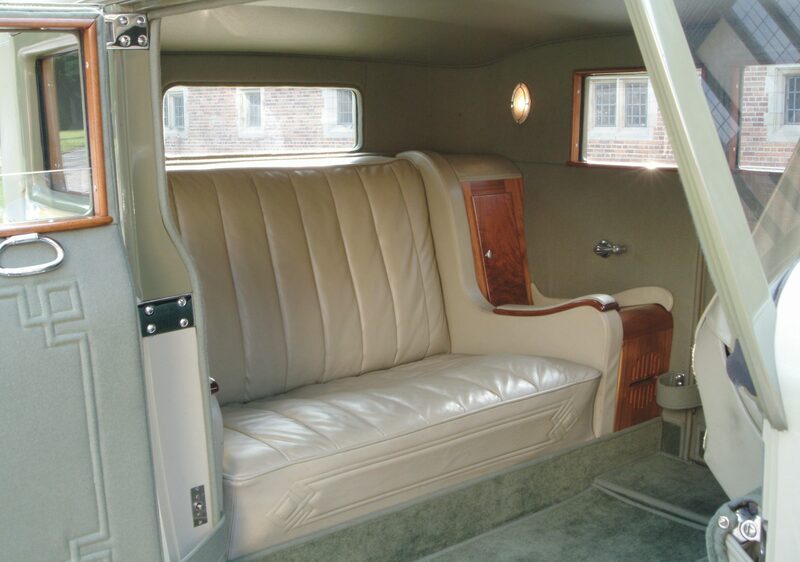 In the 1930s a radio was a seldom-seen option but the Judkins Victoria coupe, a short wheelbase luxury car, was equipped with a Crosley radio and speaker mounted next to the left rear armrest. The four-passenger interior was designed to cater to the rear occupants, with increased legroom, comfortable seating, the radio, and a front passenger seat designed to fold forward to permit easier entry and exit from the rear. With the decline in demand for bespoke coachwork in the late 1930s, Judkins looked to diversify but found little success and, in 1941, the company was forced to close its doors, ending a tradition for superb coachwork dating back to the late 19th century. There were approximately 193 closed cars comprised of sedans, coupes, limousines, town cars and broughams produced by American coachbuilders for Duesenberg, Inc., between 1928 and 1937. Taking into account undocumented coachwork, rebodied chassis and foreign coachwork, the number is better than 200, meaning that nearly one-half of all Model J Duesenbergs produced were closed cars. Sadly, only a small percentage has survived. Another fascinating design from the pen of Gordon Buehrig was the Judkins Victoria coupe. This sporty model was a four-passenger car with the look of a convertible Victoria and a large rear seating area. This is car 2375, J-354 photographed when it was new (1932) and today in its beautifully restored condition by owner Frank Kleptz. Judkins built two cars, J-333 and J-352. They sold for $14,750 in 1932.